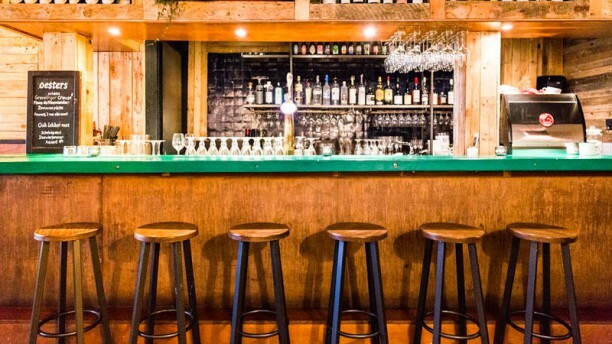 Visbar Fyrre (Deens voor ‘veertig’, wat het huisnummer van het restaurant is) in de Javastraat is de plek voor iedereen die in een ontspannen setting wil genieten van bijzondere visgerechten, oesters en lekkere wijn of een cocktail! We werken altijd met de beste producten: kraakverse vis uit IJmuiden, oesters uit Zeeland en Normandië, alles duurzaam gevangen en zoveel mogelijk biologische groente. Het menu wisselt doorlopend om altijd te kunnen werken met wat op dat moment in het seizoen is. Chef en eigenaar Folkert Scheper is geïnspireerd geraakt door de Scandinavische Keuken, die hij weet te combineren met de Hollandse en Franse keuken. Maar ook schroomt hij niet om Japanse azijnen en dergelijke te gebruiken om verrassende gerechten te maken. Bediening super leuk , eten fantastisch ! Nice place, a bit more upscale than the average, the food was very fancy and very good. Because it is a fish restaurant they do very different types of dishes - spaghetti with fruits de mer, but also fish and chips, something sushi-like, etc. But all very good. We were there on a quiet Tuesday night and were taken care of very well. Bediening was top, eten was erg lekker. Kom er graag nog een keer. Nice dishes in pretty plates, tasty food, friendly staff. The food surprised me in a very positive way and the waitress was super nice and friendly. Lovely little fish restaurant where people care about the food and their customers. A pleasant surprise! The food, both ingredients and preparation, is top and the service very friendly (which is often, unfortunately, unexpected in Amsterdam). The bill was also a pleasant surprise: one of the best ratio cost/quality I came across in town! Very nice snacks for a good price! Friendly waitress! The service was excellent - friendly staff, and anticipating the needs, though when it was getting crowded, they were a bit overwhelmed. The food was disappointing. We ordered oysters, haddock, pulpo, bouillabaisse and chocolate cake. The oysters were okay - couple of fresh ones (out of a dozen) that gave good briny taste, but also couple of not so fresh ones that had virtually no flavor and slightly old side. The pulpo didn't seem fresh, either - the texture was rather mushy, and no tension or chewiness at all. And the bread that came with the bouillabaisse, I could not eat at all. It was toasted, but had a strong rancid smell. This was the first time in the Netherlands, in over two years, I've come across bread I could not eat. It would have been better if it had not been toasted with rancid oil. Sadly, when I came back home, I also had an emergency visit to a toilet. So, overall, the service was good, but the food was well below my expectations. Very good evening. Service was perfect and meals especially delicious. We loved it ! Good cuisine, caring service, cosy atmosphere. Excellent and creative haddock-based starter. Nice dishes, friendly service. Overall healthy food with no oversized portions. Prices of wine and Cava where attractive. Only don't like the Stella beer they are serving, but that is personal taste. Would certainly recommend to others. Whoop whoop! We had a fantastic evening in this fantastic and authentic restaurant. It’s all about fish, fish and fish and what kind of fish! The choices on the menu are limited, which I love. They all read as mouth watering. We choose the 5-course surprise menu (50 euro). Happy we did! We so much enjoyed every course. We had gravid lax, mussels, schrei, oysters and scallops accompanied with a smooth white (very affordable) Venus. The service is impeccable. Very attentive, relaxed and spot on. Don’t expect a fancy hipster kind of place. It’s more like a Scandinavian bistro with the feel a cosy ship’s cabin. Exactly the kind of place one can totally unwind, be happy and forget the time (they almost had to sweep us out).